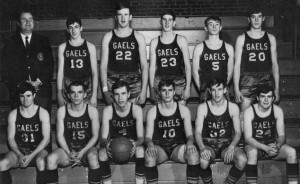 Holyoke Catholic High School Basketball team, 1968. Row 1 (seated): Michael Kennedy, Thomas O’Neill, Capt. Thomas Ginley, Glenn Larivee, David Ellison, Michael Gallagher. 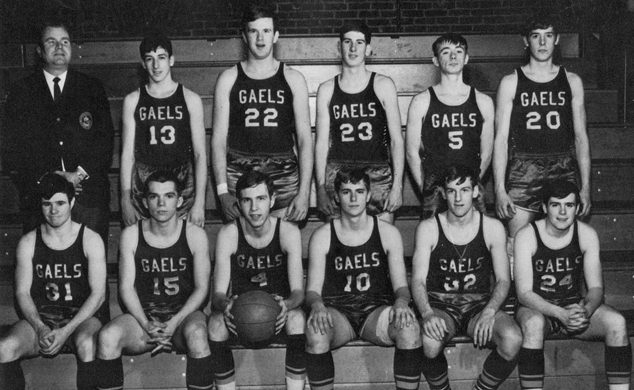 Row 2: Coach Robert Ferriter, James Weslowski, John Cavanaugh, James O’Neill, John McKissick, Kevin Boyle, Missing: Francis Lafond. Does anyone have the names? Thanks Lora, I was distracted and forgot to add names.